The Herkimer County Fairgrounds is located at the corner of Cemetery Road and Route 5S in Frankfort, New York. This site is centrally located in New York State and is only 15 minutes off the NYS Thruway from either exit 30 or 31 and very easy to find. Traveling from the North or South by Route 12 Frankfort is only 15 minutes from Utica. travel Route 12 to Utica; take Route 5S East to Fairgrounds ramp. Promoters Carol Vespi and Don and Nancy Hartman have extensive experience in show promotion. 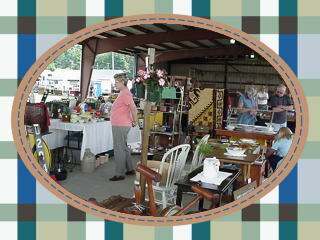 The Hartmans have been antique dealers for over 30 years and have run shows in Central New York for most of that time. Carol Vespi previouly owned Antiques and More Annex in Little Falls NY as well as traveling the show curcuit selling reference books and dealer supplies before settling down and opening her multi-dealer shop. . After the sudden death of her beloved husband Frank she closed the multi-dealer shop and she currently has re-entered the show curcuit selling a wide variety of country antiques. Whether you attend as a vendor or shopper please be assured that the promoters are working hard to make this a wonderful experience for all.